It’s never happened before – a military veteran deported from the United States – then later granted citizenship. But now, three U.S. military veterans are one step closer to doing just that. Senior Investigative Reporter Stephen Stock reports in a video that first aired on April 19, 2017. Hector Barajas has been fighting to get back into the United States for more than 10 years. Now, he’s one step closer to realizing his dream. He’s just received a pardon from Gov. Jerry Brown that may change his life. 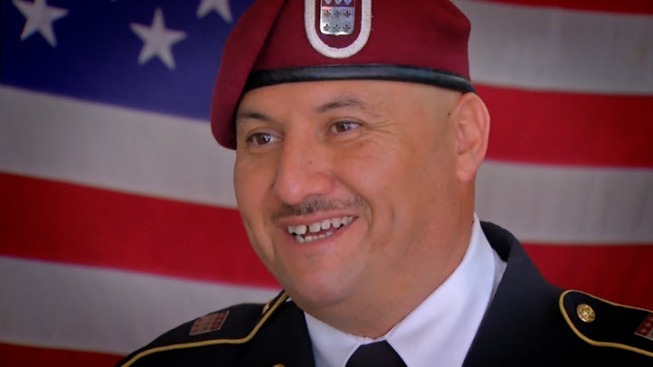 Hector Barajas, a former U.S. military paratrooper born in Mexico and deported in 2004 for committing a crime, was granted a full pardon by Calif. Gov. Jerry Brown. He posted this video on Facebook reacting to the news. Barajas was deported in 2004. It was a crushing blow for the decorated veteran. Just three years earlier he’d been honorably discharged from the military. He had been a paratrooper and served in the 82nd Airborne Division. But after his military career, Barajas couldn’t find his footing. He spiraled into drug addiction and crime. He was convicted of shooting a firearm in Compton, California, and sentenced to 13 months in prison. When he completed his sentence, he was told he was being sent back to Mexico. He hadn’t been to there since his family left the country when he was 7 years old. When he tried to come back to the U.S., he got caught, and was given lifetime deportation. Since then, he has started a Deported Veterans Service Center in Tijuana, Mexico. Barajas and the ACLU in Los Angeles have written a report that details the stories and statistics of hundreds of deported veterans. As of the last count, the number of deported vets was 315. NBC Bay Area has been following the deported veterans and their fight for the past five months. These men and women were legal residents who say they were promised citizenship when they joined the U.S. military. But after leaving the service, they committed a crime, and were deported from the very country they fought for. That law sets out a series of “deportable” crimes – called aggravated felonies - for all non-citizens. These range from violent crimes, to what might be considered minor offenses such as drug possession and failure to appear in court. Even non-citizen veterans who cross that legal line can be deported under this 1996 law. For Barajas, the Governor’s pardon clears his criminal record, which means U.S. citizenship is now a possibility. “I could be out of here within less than three months,” says Barajas. That would mean he’d be re-united with his 11-year-old daughter in the San Gabriel Valley. “Now I got the most precious thing that all of us want and that's an opportunity to go home and you can’t buy that for a million dollars,” says Barajas. Two more deported veterans: Erasmo Apodaca and Marco Medina, were also granted clemency by the governor. But another honorably discharged veteran who was deported, Enrique Salas, whom we also visited in Tijuana… was not. A new bill pending in congress, H.R. 1405, would grant citizenship to all veterans who have served honorably —allowing them to all come home. Hector Barajas is hoping to return soon to the country he was willing to die for. He's already been offered a job in the U.S. - with a roofing company. And he hopes to share a burrito in America with his daughter. He says he likes the burritos better in the U.S.